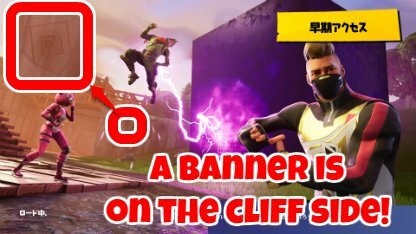 Week 9 of the Fortnite Road Trip Challenge features a second banner! We reveal the location on the 9th loading screen clue and the Secret Banner reward. Players who complete 9 of the Week Challenges will be awarded with a loading screen that contains a hint to the hidden banner location. Looks like Rex has managed to get on the cube's bad side. The location is at the bridge southeast of Shifty Shafts! Note: You can complete challenges from any 9 different weeks to unlock the secret Banner location. You don't have to accomplish weekly challenges in chronological order. Head to the cliff south of the bridge. The Secret Banner will appear when you approach. It's high up on the cliff, so you will need to build a stair to reach it!